Here we are on the eve of another Project Management Institute Project Management Professional (PMP)® exam change following release of PMI’s new edition of A Guide to the Project Management Body of Knowledge (PMBOK® Guide). This is the first in a two-part article in which I highlight some changes to the PMBOK® Guide. In the second part, I will suggest an approach to digesting the new version and share some thoughts about the exam changes. First, the changes to the processes and how they are organized is not changed substantially. A couple of processes have been renamed to create better consistency, and a couple of new processes have been added. But the overall structure with Knowledge Areas (KA) and Process Groups (PG) is the same. To be sure, details with inputs and outputs have been modified, but that would make for some very tedious reading, so I will talk about more interesting changes. Three new sections are included at the beginning of each KA: Trends and Emerging Practices, Tailoring Considerations, and Considerations for Agile/Adaptive Environments. Each KA now addresses these topics with specifics pertinent to that KA. Trends and emerging practices include tools like earned schedule in the Cost Management KA, which is not a new practice, per se, but is something that wasn’t mentioned in the PMBOK® Guide – Fifth Edition. Another example is use of multiple contractors and standard contract forms amenable to large, international megaprojects in Procurement Management. The idea of self-organizing teams is identified as an emerging practice in Resource (formerly called HR) Management. An expanded the view of who a stakeholder is and involving all team members in the effort to engage stakeholders is a trend in the Stakeholder Management KA. Tailoring considerations make explicit what was more subtly implied in previous PMBOK® Guide editions. Questions help define how to make these processes work given the uniqueness of the organization such as constraints and stakeholders. For example, regarding Communications Management, how many languages are used among project team members, and are the team members geographically distributed? How much certainty is there around the requirements and how will that impact Scope Management processes? How will project size and complexity impact Risk Management processes? The idea of tailoring isn’t new to the PMBOK® Guide, but inclusion of these sections with questions specific to each KA brings tailoring to the fore and makes the document feels much more like the flexible framework that it is, and much less like a prescriptive methodology that it is often misunderstood to be. Considerations for Agile/Adaptive Environments is the third new section in each KA chapter. These high-level, brief sections provide project life-cycle context for understanding the processes. The impact of uncertainty on the processes and the benefits of doing things like chunking work and getting regular feedback are touched on in these sections. This brief section is enough to keep the project type in mind for the reader who is evaluating how to apply the processes and tools. Of course, the details pertaining to projects in an adaptive environment are now covered in The Agile Practice Guide, developed in collaboration with Agile Alliance, which now ships with the PMBOK® Guide – Sixth Edition. In addition to those new sections, some old concepts get new emphasis and some new concepts and artifacts appear. The role of the project manager, for example, gets emphasized more than in past editions. The groundwork for this was laid years ago with PMI’s Talent Triangle™. Leadership skills and soft skills like navigating politics to get things done get more attention. Also, business documents including the project business case and project business management plan get addressed and are springboards for emphasis on making sure that projects are aligned with the business and delivering business value. Overall, I think the PMBOK® Guide has become more consistent with each revision. In addition, the diagrams are much cleaner and most are easier to understand. The grey-colored pages are not particularly pleasant to read, although I appreciate that it is due to preventing illegal copies and protecting intellectual property. Whatever you have to say about it, there is no disputing that it continues to grow. It is now a whopping 756 pages long! My next article will suggest an approach to digesting the new PMBOK® Guide edition. In the meantime, I’d love to hear what your thoughts are. 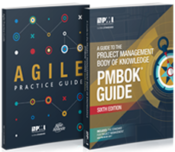 What do you like or dislike about the PMBOK® Guide – Sixth Edition?